Figure property of Daniel Overbey. Energy use intensity - or EUI. It has been called "the miles per gallon rating of the building industry," but many design and construction professionals are not entirely sure how EUI is defined and what its utility is with regard to project. Below is a primer to help get anyone started. 3. Communicate the anticipated energy use for a particular project based on design performance or energy modeling (sometimes, this latter use is distinguished as pEUI - for predicted). Site EUI or Source EUI? EUI is expressed relative to either site or source energy. 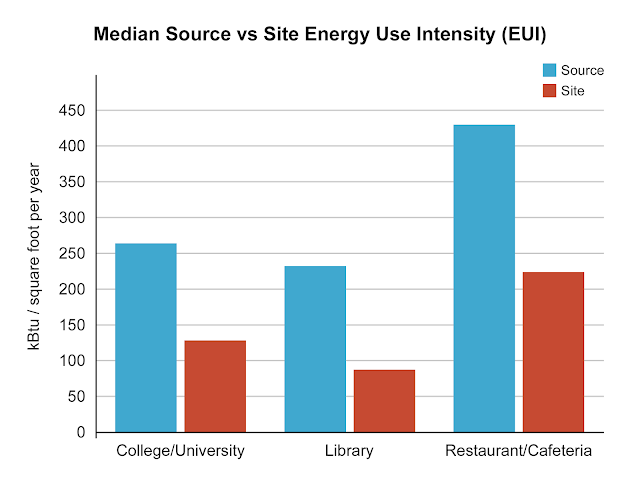 Site energy is most often referenced in the design community. In simple terms, site EUI is the energy consumed at the building site and is reflected in the utility bills paid by the owner. 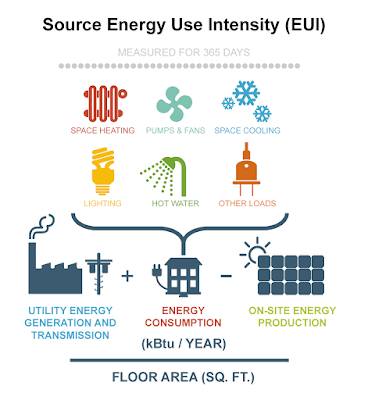 Source energy is a more accurate representation of a building's energy footprint as it considers the site energy as well as the energy lost during production, transmission and delivery to the site. It is also worth clarifying the distinction between net EUI and gross EUI. Net EUI is determined by comparing the gross EUI - or the annual energy consumption from all sources - to the Renewable Production Intensity (RPI). If the annual renewable energy production is greater than the gross energy consumption, the project is said to be net zero energy. 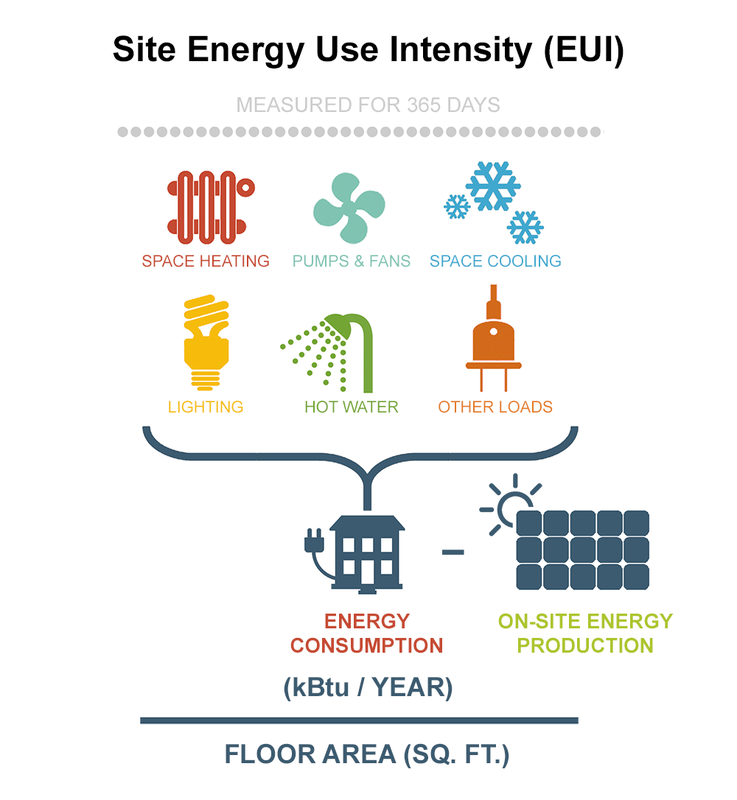 In May 2007, the American Institute of Architects (AIA), the American Society of Heating, Refrigerating and Air-Conditioning Engineers (ASHRAE), Architecture 2030, the Illuminating Engineering Society of North America (IESNA), and the U.S. Green Building Council (USGBC), supported by representatives of the U.S. Department of Energy, agreed to define the baseline for their common energy performance target goals as the national average energy consumption of existing U.S. commercial buildings as reported by the 2003 CBECS. The U.S. Department of Energy's Commercial Buildings Energy Consumption Survey (CBECS) is a national sample survey that collects information on the stock of U.S. commercial buildings, including their energy-related building characteristics and energy usage data (consumption and expenditures). 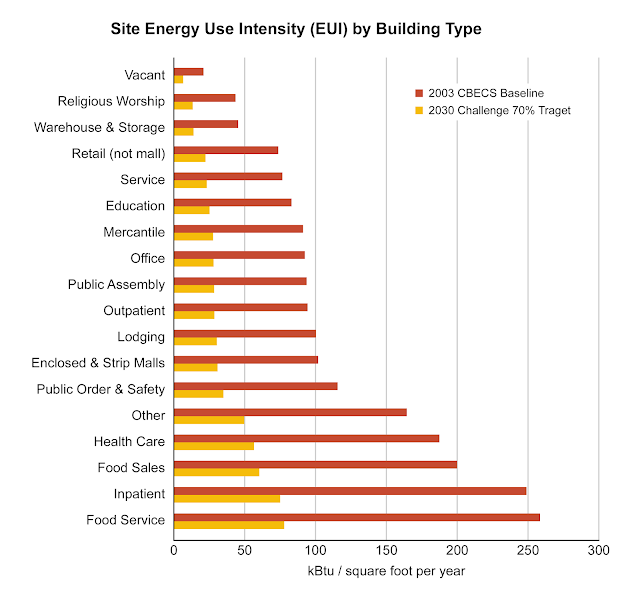 Recorded data from CBECS has shown that EUI may vary considerably by building type. 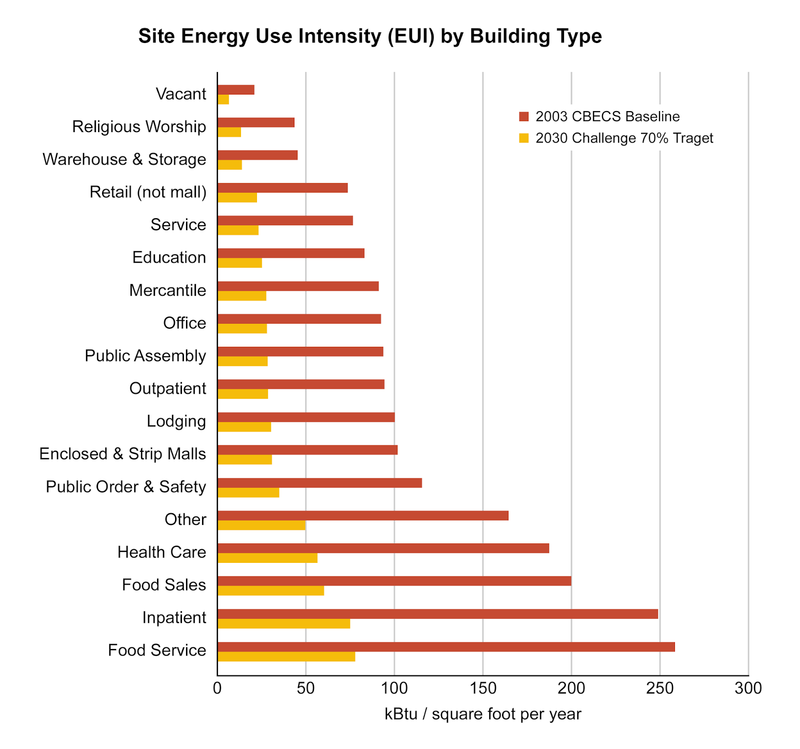 Consider the following data regarding commercial building EUI for various building types. In the figure below, baseline 2003 CBECS EUI data is offered versus the current 70 percent reduction target for the 2030 Challenge. Figure by Daniel Overbey. Baseline data from the 2003 CBECS Survey Data for USA. By definition, source EUI will be greater than site EUI. It is also worth noting the magnitude of the differences by building type. Figure by Daniel Overbey. Data from the 2003 CBECS Survey Data for USA. How can a design team quickly determine the appropriate EUI target for a project? There are a number of great resources to consult. In particular, the Zero Tool by Architecture 2030 is easy-to-use and well-suited for sustainable design professionals striving to meet the 2030 Challenge.